Many investors recognize that the bond market provides an opportunity for asset class diversification, but what may go unappreciated are the insights that bonds can provide for investments in the stock market. There are three data points in particular that can be useful for investors building portfolios in stocks. The actual rate of inflation that an investor experiences over their investing timeline has enormous consequences for their economics; at a minimum, investors hope and plan for a return on their money that matches inflation to maintain their purchasing power. When making return projections for a given investment goal, like retirement savings, it generally makes sense to apply an assumption for the rate of inflation over that period. Investors can use historical inflation data, or the most recent measure, or can make a guess about what is likely to happen in the future. The most recent value of 2.08% suggests the bond market currently believes that to be the likely annual inflation rate over the next ten years. Approaches to valuation for stocks like the Capital Asset Pricing Model and mathematics to analyze options like the Black-Scholes model require an input for the “risk free” rate. Investor preference can dictate what rate they choose for this purpose; the 3 month T Bill rate is often useful due to the regular supply via Treasury auctions, the minimal duration risk, the high liquidity, and the full backing of the United States government credit quality. Board of Governors of the Federal Reserve System (US), 3-Month Treasury Constant Maturity Rate [DGS3MO], retrieved from FRED, Federal Reserve Bank of St. Louis; https://fred.stlouisfed.org/series/DGS3MO, September 5, 2018. Viewing the change and volatility in the chosen rate over time can also help inform expectations for the stability of the model. For example, in the CAPM calculations, a 3 month T Bill rate at 1% implies a very different value for a subject stock than the same rate at 2%. The “yield curve” is made up of treasury bills, notes, and bonds with maturities ranging from a few days to as much as thirty years. The historically normal shape of this curve slopes upward, with the shortest bonds showing yields that are relatively lower than bonds with longer maturities. There are different theories for why the curve is normally shaped in this way, with implications for investor preference and opinions about risk, but for decades the typical relationship between spots on the curve is that longer maturity bonds yield more than shorter, with the amount of difference rising and falling over time. When the curve deviates from the historical norm, and either “flattens” to where there is little difference between the yields at different spots on the curve, or “inverts” to where shorter rates yield more than longer rates, there may be serious implications for the economy and for the stock market. ​Federal Reserve Bank of St. Louis, 10-Year Treasury Constant Maturity Minus 2-Year Treasury Constant Maturity [T10Y2Y], retrieved from FRED, Federal Reserve Bank of St. Louis; https://fred.stlouisfed.org/series/T10Y2Y, September 4, 2018. Market participants may read many portents into a flattening or inverted yield curve. Some common concerns are that a curve that deviates from the norm in this way suggests that a recession is likely in the near future. A more concrete view is to consider how the actions of the Federal Reserve propagate out through the bond market. In the recent case, the Fed has raised their funds target several times, which led to the short end of the market rising too (see the 3 month Bill rate above). The points on the curve further out, such as at the ten year and thirty year spots, have not yet priced in the likelihood of higher inflation or the Fed funds target to sustain in the current range. So the short end yields are up, but the longer yields have risen less on a relative basis; this leads to a flatter curve. The Federal Reserve Bank of St. Louis provides an excellent resource for economic data; the charts and figures for this article are all sourced from FRED. This article is intended for educational purposes only, and is not a solicitation to buy or sell any security or investment. Investors should consult with a qualified professional, and carefully consider the risks and potential rewards of any investment strategy prior to making an investment. Why did the market "go down" in late January, 2018? There are many possible reasons, and most of the time a substantial move in the market is really about a combination of things (if there is any real reason at all). My current vote for the "biggest" reason for this particular fall in the price of stocks is what was happening in the bond market, which was itself reacting to what was happening with the Federal Reserve policy, which was itself...complicated. In brief, the Federal Reserve in the United States has a few main purposes, which are often reduced to the "dual mandate" of promoting employment and moderating interest rates. The entire financial system relates more or less directly to the cost of money over time (aka interest rates), and inflation is a major consideration in how the markets set appropriate interest rates for a given investment or transaction. Again, speaking in simple terms here, for an investment to yield an economic gain to the investor, the realized return must be greater than the rate of inflation for the same period. If not, the investor is actually losing "purchasing power". For example, if I have $1 today and a can of soda costs $0.50, I can buy two cans. If I wait a few days, and the price of the soda rises to $0.55 but my $1 is still just $1, I can no longer buy two cans...the purchasing power of my dollar has eroded due to inflation. In January of this year, two things seemed to come together to jolt the market: (1) the major US stock indices were setting records for the longest period without a "correction"; and (2) the Chairwoman of the Fed was stepping down and aside for her successor. My view is that these two factors were causing the market to process what might happen with inflation, both from pressure of a "hot" stock market, and from the relative uncertainty as to how the new Chairman would respond to that pressure. The US has enjoyed a very long period of relatively tame inflation, and the prospect of a quicker increase in consumer prices can be unsettling. 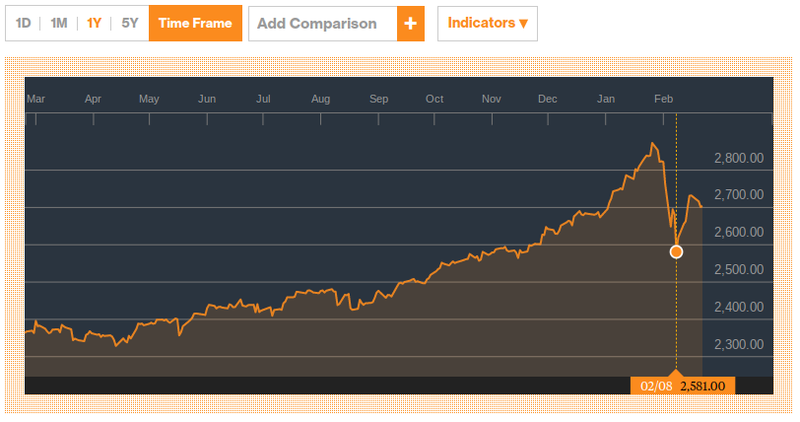 Investment options in an inflationary period? Some stocks have historically behaved as a sort of proxy for "fixed income"; utility stocks are an example that some investors hold primarily for their relatively steady stream of dividends. The issue here is that many utility companies are not free to raise prices to match inflation, which may limit their ability to raise their dividend payment rate. Some companies stand to benefit from rising prices, particularly in industries where the profit margins rise along with prices. It can be useful to consider whether a sector or individual company belongs to that camp, or are in the position of being squeezed on profits when their input prices rise due to inflation. Over the long term, residential real estate seems to have kept pace with inflation. However, investment products tied to the real estate markets may be complicated by holding exposures to home builders, construction supply companies, etc that draw their own value from economic activity related to real estate and not necessarily from the property values themselves. Further, real estate related investments tend to show some sensitivity to interest rates due to the impact of higher mortgage rates on the ability or desire for people to get a home loan. Time to review with a pro? DRW Financial is happy to provide an initial consultation and portfolio review to residents of Tennessee, Illinois, and Georgia at no cost. Email David@DRWFinancial.com or complete the contact form at this link for more information. Let's get two things out of the way early: (1) there is a lot of noise in the news right now about Bitcoin and its crypto-cousins (and too little information, in my humble opinion), (2) this post is a contribution to the noise, but hopefully contains a little information relevant to my client base and readers. There are plenty of articles going around about what crypto currencies are supposed to be, and how blockchain technology is meant to work, so I will keep my comments on this aspect super brief. The blockchain is sometimes referred to as a "distributed ledger" for financial transactions, which can in many ways bypass the existing infrastructure of banks and payment processors and clearance / settlement facilities currently involved in exchanges of value between parties. And while this ledger is maintained and processed in a relatively "public" way by market participants, individual participants are able to act in a relatively anonymous way. Bitcoin is a medium of exchange on one version of blockchain, and it follows a very specific protocol or set of rules about how new Bitcoins can be introduced to the market and how transactions in Bitcoin between parties can be processed (this activity is collectively referred to as "mining"). Bitcoin itself has "forked" into some new variants that have expanded or refined protocols that attempt to address some perceived challenges with actually using a crypto currency, and there are also different approaches to the blockchain that support other coins, like Ether on the Ethereum network. so, should you own some? Chances are decent that you are more aware of Bitcoin and its brethren because the prices of crypto currencies have risen so dramatically in the last year; it is a basic function of a "bubble" or hot market that big gains in value attract attention, which inspires a desire to participate, which pushes prices higher, which causes the cycle to repeat...for a time. The opportunity to realize an economic gain requires an ability to enter, hold (and collect any distributions like dividends or interest or rent), and/or exit the investment, inclusive of any related costs. From the perspective of an individual investor, any one investment opportunity should likely be considered within a broader context of their financial circumstances. In the planning profession, we talk about assessing risk tolerance, defining financial goals, identifying available resources, and developing a comprehensive approach that ties all of those facets together into an actionable plan. A "store of value". This line of thinking makes crypto coins analogous to gold, which some market participants have looked to for years as a hedge against fluctuations in their home currency (like the US dollar); the belief here is predicated on an assumption that if there were a major devaluation in the dollar due to macro economic or political shifts, gold may retain more relative value. This belief is highly subjective, and the performance of crypto through cycles that historically benefited gold has yet to be seen. "Anonymity". Some market participants desire a means of economic exchange that does not flow through the legacy banking system and is less visible to the government. Crypto coins do seem to offer this opportunity, although there are still points of contact between the legacy systems and the blockchain, the anonymous nature of the system has produced some examples of "wild west" abuses within the system, and legacy banks and governments are making moves to pull the blockchain into alignment with the existing infrastructure. A medium of exchange, independent of anonymity. This may be the most prosaic view of the crypto currency future. In this model, one or more of the current coins could turn into the default option for digital exchanges of value, i.e. how you pay for stuff. The total number of Bitcoin that will ever be mined is already set, built into the currency's nature from the beginning. That programmed scarcity has some market participants convinced that there will be a steady demand for coins (or fractions of coins) by people just wanting some to use for quotidian purchases. Do any of these points lead to a rational view that Bitcoin will trend higher from here? Each of those possible vectors for expected growth involves a number of highly subjective assumptions that I am not confident to make at this time. What about the mechanics of investing in a crypto currency? Early adopters in these markets have seen a number of "wallets" and exchanges arise to provide ways to buy, hold, and transact with their coins. While the experience for many has been unremarkable (in a good way), there have also been a number of high profile failures with coins "lost", "destroyed", and stolen in ways that would seem foreign to people whose financial experience is limited to dealing in dollars and with established banks. With that in mind, it may be reasonable to assign a "carrying cost" to holding Bitcoin, with the cost less a financial one, and more a percentage chance of losing some or all of the holding due to quirks in the still developing infrastructure. The current market in Bitcoin, Litecoin, Ether, etc suggests that there is presently a steady buy side demand for the coins; as mentioned above, this steady demand has been self-perpetuating, as new buyers push the prices higher, attracting new buyers, etc. The sell side of the market, and how the market itself would react to demands for liquidity for future sellers, has been relatively untested -- and this is currently my own, personal preoccupation with these market as a potential "investment". Having watched the stock and bond and real estate markets for a while, in both a personal and professional capacity, I have seen these supposedly mature asset classes go through cycles of paralysis, crisis, and illiquidity. The very nature of the still nascent crypto currency market causes me significant concern about what a liquidity crunch would look like for these coins. At present, there do not appear to be any sources of distribution-type returns from simply holding Bitcoin...as with gold, there are no dividends or interest or rents available to owners. That may change in the future (maybe coin holders will be able to "lend" their currency to people who need some for transactions?). There ARE transaction costs within the blockchain, and at least with in the example of the Bitcoin blockchain, those transaction costs (and times required to actually complete a transaction) have been rising, from a few pennies each time to as much as $20 or so. These variable costs are in some ways analogous to commissions, and present a source of friction or drag within the network for exchanges of value. None of the above suggests that the actual process of buying, holding, and selling a crypto coin for a (desired and potential) profit is impossible, just that there are some legitimate challenges in the current scenario. Now, in terms of how an individual investor might perceive an investment in a crypto coin and place it within their overall investment framework, the thought process can be a bit more straightforward. In that framework, if a person were motivated to invest in Bitcoin (or similar), it may be most appropriate to treat it as one component within a larger portfolio, with allocation size determined by desired risk exposure. By way of example, many investors may now focus their stock and bond allocations on internally diversified investment products, like mutual funds or ETFs. A purchase of Bitcoin as an investment, in contrast, would look more like investing in a single company's stock; further, based on the relative volatility, size of the market, and potential liquidity constraints of Bitcoin, the comparison would need to be to a similarly sized and volatile stock...I'm thinking a bio-tech stock whose potential profit is entirely based on the unproven efficacy and eventual approval of a drug might be a reasonable analog. It would be difficult to rationalize an investment allocating a large percentage of an investor's available resources to a highly volatile stock with a non-zero chance of failure and collapse; similarly, it would likely be inappropriate to commit those resources to an investment in a crypto currency, simply based on the risk of loss. Everyone's talking about Bitcoin and the other so-called "crypto currencies". Much of the present attention seems to be driven by a fairly typical "fear of missing out" bubble. Investments in crypto coins have both idiosyncratic and traditional considerations for investors. Proceed with caution! Current and prospective clients of DRW Financial should feel free to email or call David with questions on how or if it is appropriate to incorporate an investment of this sort within their overall plan. Many of the posts I write are as much for me as for anyone out there looking for new insights on their financial condition. Today's is one such post. I have written elsewhere about how our money choices reflect on our values, and that when there is conflict between what we say we value and how we live our values, there is an opportunity for self-reflection and a choice to align the two. But where does ego fit into this discussion of values and money? One example within my own budget and experience involves technology, specifically smartphones and computers. I use an Android based phone and a Chromebook for my work and personal computing needs. These choices were originally at least a bit driven by economics: iPhones are expensive and in the early days just having an iPhone required a specialized phone plan that cost more than average; similarly, a decent Chromebook costs around $200, while a similarly featured Windows machine might cost twice as much (or more), and a Mac might cost 3x - 4x just to get started. But even though I may have started out with fiscal discipline in mind, what happened over time is that at each opportunity to replace or upgrade my equipment I would inevitably spend some time looking at the "nicer" options available. A $200 Chromebook has proven to be sufficient, but the $600 one may be prettier and have some snappier specs... The $150 - $200 "mid range" Android smartphone does 95%+ or more of what the current "top end" phone may offer, but there is always that voice in the background saying "wow, that fancy phone is cool​!" This is where the budgeting rubber meets the road. When faced with an option to spend more or less for essentially the same experience, it is crucial to be honest. When explaining (to yourself or others) why you want the more expensive option, choose to have enough perspective to examine those reasons objectively. It is so easy to justify a choice that we want to take, but it can be hard to be honest about the quality of those justifications. Shopping while under the influence of vanity or with a heightened sense of your needs can lead to some financially unsound decisions. Some folks don't have any investments. Others are in a situation where their circumstances dictate a very "keep it simple" approach. But for much of the rest the population, there may be value in working alongside a professional investment manager in pursuit of an "optimal" investing approach for their specific needs. DRW Financial offers investment management solely on a fee-only basis and as a Registered Financial Adviser. This means our only compensation comes from providing advice, not by commissions on transactions. We believe this allows us to offer that advice with fewer conflicts of interest and to act as a fiduciary for our clients. A retirement account left behind at an old employer (401k, 403b, 457, etc)? A current retirement account that you set up and haven't looked at in a while? Or one invested in a way you aren't sure matches your needs? Persistent issues with owing more taxes than you think reasonable? Questions about the costs implicit in your current portfolio? Worries about making your savings last through your retirement? A desire to address inter-generational financial concerns? A small business or self-employed income and want a more sophisticated approach to managing those finances? These are a few examples of issues and areas where we have helped others improve their understanding and their approach to investing. DRW Financial works with artists and engineers, physicians and educators, "millenials" and retirees. do you need financial planning? 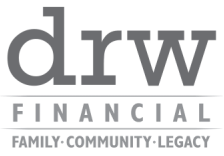 "I don't have any finances to plan"
DRW Financial offers financial planning services on a flat fee basis. This means that there is an agreement upfront to address a given scope and scale of planning, and a stated fee that covers a full calendar year of work and revisions to that plan. For many people, paying income taxes is something that happens "automatically" with every paycheck, via the mechanism of payroll deductions. Line items like Social Security, Medicare, and an approximate amount of income taxes owed come out of each paycheck, and the process of completing and filing a tax return in April of the next year results in a reconciliation of that process: did the taxpayer pay "too much" or "too little" over the course of the year, and do they get a refund or a bill for taxes due? But for folks who earn income "on the side" or are self-employed, payroll deductions are far less common. For many people in this scenario, the typical approach is to pay "quarterly estimated taxes" via the IRS form 1040 ES. The general idea here is that the taxpayer will figure out what they are likely to owe for the full year, and make four equal payments by the quarterly deadlines. In reality, for many self-employed people their income does not come in conveniently steady streams, and accurately forecasting their full year income can be difficult. For people in that situation, it may be necessary to make adjustments along the way to get the cumulative tax payments close to the right amount. Even for people who get most of their regular income from a salary or W2 paycheck, there may be a need to consider making 1040 ES payments. Drive Uber for extra cash? Rent out a room on AirBnB? Realize some significant investment gains? All of these could potentially raise the tax liability for the year; if the amount paid in along the way is too low, there could be a penalty in addition to the eventual tax owed. If any of the above applies to your situation, get ready for the first 2017 quarterly due date in mid April. If this date seems familiar, it's because that's the 2016 personal return filing deadline too! If you belong to the portion of the population aged 60 or older, you have probably given a good bit of thought to Social Security; if you are much younger than that, the concept is probably not high on your current list of priorities. But as a financial planner and investment adviser, I routinely find that the various benefits available via the Social Security Administration are an important and often misunderstood part of folk's financial picture. One thing to understand upfront is that almost everyone earning income in the United States pays a tax into the Social Security fund throughout their earning years. Although Social Security benefits are sometimes described as "entitlements" in a way that suggests otherwise, the money that retirees get back comes primarily from their own contributions and those of their peers and the generations preceding / following them. Some of the benefits available via Social Security are available to spouses and children of the income earner who paid into the system. For instance, in a two parent household if one worked outside the home for a wage and the other spent their working years raising kids and caring for the home, the one without an income history may also qualify for a retirement benefit based on the contributions of the working spouse. The Social Security Administration offers a couple of tools that are really very valuable for gaining a basic understanding of where a given person stands in relation to their potential benefits. The "My Social Security" is a page that does require a log-in, and provides much more information than the estimator, including a history of wages and a measure on whether you have accumulated sufficient "credits" to qualify for Social Security benefits. Given that there is no cost but meaningful benefits to having this information in hand, it is well worthwhile to take a moment now and regularly in the future to check in on your personal benefits. We now live huge chunks of our lives online, and do ever more of our financial transactions and interactions via email, applications on our phones, and through websites. As a provider of financial planning and investment advice, I am perhaps a little more sensitive than most to what can go wrong in terms of online security and privacy. The recommendations below are not intended to be comprehensive or "fail safe", but could form a foundation for improving online safety. This one should be obvious, but it seems that a number of us out there in the world are still resisting the step to add a PIN, fingerprint, or password to our smartphone. These devices typically have unrestricted access to email, social media, and maybe even financial accounts via apps. Accidentally leaving an unlocked phone on the bus, coffee shop table, or a park bench can provide one-stop access to a stranger. At a minimum, a 4 digit PIN or "pattern lock" can provide a measure of protection, especially against the mildly curious. BONUS: take a minute to review the "remote lock" function for your phone model, operating system, or carrier. An increasing number of accounts (email, Facebook, Twitter, etc) offer what is called "two factor" or "two step" authentication or log-in. What this means in brief is that to initially access your account on a new device (phone, laptop, tablet) you must have both the password AND a code sent to a trusted device. So you may be logging into Gmail on a new computer and Google will send a text message to your phone, adding a layer of security to that log-in. Generally, you can choose to have your account "remember" that device, so you do not have to go through the two step process every time. HOWEVER, if you are using your phone as a part of this two step process, it becomes even more important to password protect or otherwise lock your phone. The first line of defense against another person accessing private accounts may just be having a decent password. Gone are the days of being able to pick a pet's name or a clever but simple combination of initials and birth date. And it is not reasonable to use the same password for multiple services. Current best practice in strong passwords require length and randomness. One approach could be a string of 8+ random numbers, letters (both lower and upper case), and symbols. A challenge with this option is that the password can be overly difficult to remember even one account, much less a similar string for dozens of accounts. A second option can be a "phrase" or combination of random words: "bananaumbrellafloristdog" is an example that may work in some scenarios...throwing in a number or symbol would make it better. ​Using a "password manager" may be helpful for some people, or having a readily accessible (but secure!) reference with various passwords could be supportive. Some browsers (the software you use to access the internet) now default to a "secure" mode when possible. You can check whether your access is in this secure mode or not by looking at the address bar. The actual language or graphic varies by browser, although most will show some version of a "lock" and include the letters "HTTPS"; an example from Chrome is in the image below. To be clear, being in "HTTPS" vs "HTTP" does not guarantee against invasions of privacy or remove any personal responsibility for security, but is better on a relative basis. is it bad to die with $0 left? I think it is pretty common for people to fear "running out" of money. We've all heard stories of people "dying broke" or reduced to poverty late in life, and those stories are both sad and scary. So it makes a great deal of sense to avoid that fate. Financial planning and prudent investment management play a crucial role in an overall approach to help ensure there are sufficient assets and income in place as we age, and they can also help prevent having too much​ left over as well! how can there be too much money? If we all agree to the premise that it is generally not comfortable to run out of money during our lifetimes, it may then seem counter-intuitive to discuss the opposite challenge of dying with too much income or assets. But prudent personal financial management also involves making a plan for the eventual distribution or transfer of an estate, as well as the care of the people and causes that have mattered to the person during their life. A well crafted financial plan will seek to find an appropriate balance between having too little and having too much. quick look at "too much"
What happens when you die with "too much" in terms of assets? In very general terms, current tax law levies a charge when something of value changes hands. Whether in life or at death, gifts of money or other valuables can incur a "gift" or "transfer" tax, and when the tax comes into play it can be significant. Estate planning professionals and tax experts have various strategies to manage the impact of these taxes, but the transfers must be accounted for in any case. Currently, the tax code at the US federal level has a fairly high exclusion for gift and transfer taxes (over $5M), but each state has their own policies to consider. Apart from the potential financial complications, there may also be some lifestyle and psychological impacts associated with holding on to most or all assets until death. One very simple way to see this is that gifts made during life can be witnessed and enjoyed, both by the giver and receiver, where gifts left at death (via a will, for example) happen at a time where the giver cannot really participate in the experience. Annuity benefits -- Many people accumulate or hold retirement assets in vehicles that offer the option to "annuitize" at some point in the future. In the pure sense, an annuity is a payment that spends down an amount over a specified time period; in some cases that time period is "for life". A pension benefit or a commercial insurance product are two common examples where the owner of the asset may have the choice to take a "monthly payment for life"; however, there may also be other payout options. In some cases, it may be possible to choose a smaller payment that can pass to a second person after the first dies. Or it may be possible to forgo the annuity election altogether and take a lump sum distribution from the account. The "right" choice among these options should be informed by the actual circumstances unique to the case: does the person need income? Do they have dependents or heirs that could benefit from a different arrangement? Does their tax status recommend a particular strategy? Deferred income -- traditional IRA, 401k, and similar retirement plans (excluding ROTH style for the purpose of this point) all represent deferred income, where the deferral means it was not spendable by the earner, and so income taxes where not collected along the way. While these types of retirement savings accounts can be very useful and powerful within a financial plan, it is important to not lose track of the fact that there will eventually be an income tax liability on the money in those accounts. For people who die with money left in an IRA, for example, what passes on to their beneficiary comes with a tax on any eventual distributions. The points above are meant to highlight that, while having assets and income is probably a better state of affairs for most people than having none, it is also the case that having significant assets and income involved demands careful planning as well. A robust financial plan with a qualified financial planner, such as a CFP®, should seek to address both ends of this question, from dying with too little to dying with too much, as well as a number of other important financial considerations. Click the "let's talk" button to send me an email. I am a fee-only, registered investment advisor offering highly transparent financial planning and investment management advice in a fiduciary context.